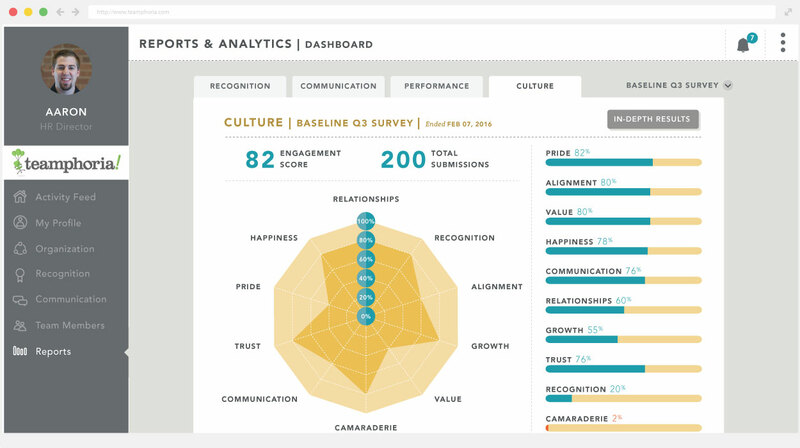 Using surveys, pulse tracking, recognition and awards the employee engagement software measures company culture and morale in real-time. 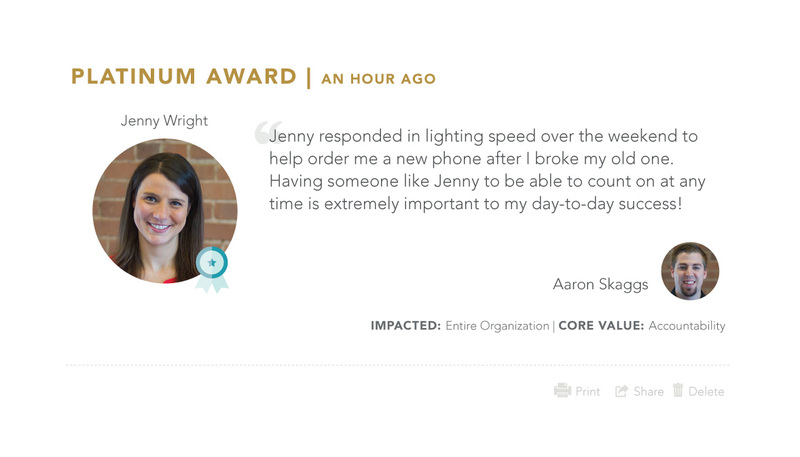 Employees are more loyal when they feel valued and recognized for their accomplishments. Millennial employees understand it best, that all ages want praise and acknowledgment! Employees and managers create great company culture revolving around recognition and awards with Teamphoria’s free employee engagement software. With Teamphoria, you can create free custom tools and management roles to make communication easier and more effective, saving time and increasing productivity. Employees can take pulse surveys and post items to private social feeds, including video, to create a private corporate intranet. All employees across multiple locations use the secure website or download the mobile app to communicate and stay connected. All organizations need simple and effective employee reviews with 360 degree options. 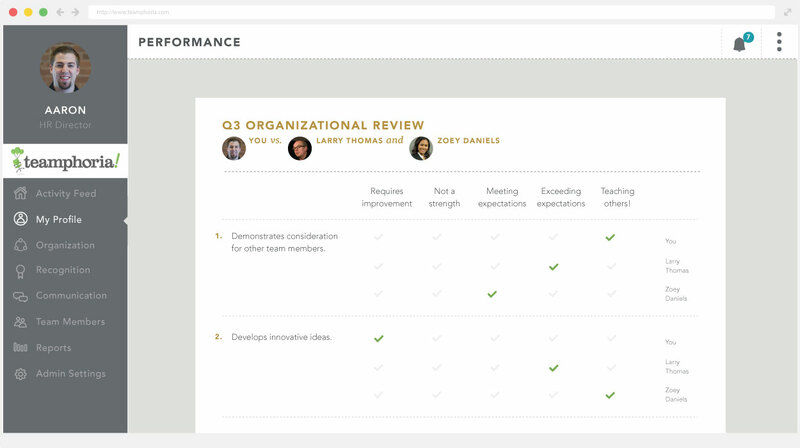 Teamphoria’s free employee reviews maximize ROI by helping team members reach their true potential and by saving administration, management, and employees time. The goal setting software allows employee goals to be shared and tracked by specific team members or entire departments. Since implementing Teamphoria we’ve witnessed a reduction in employee turnover by 37% and an increase in employee engagement by 25% over the course of one year. – Ryan Schwalbach, CEO Now Courier, Inc.
HOW DOES RECOGNITION CREATE GREAT COMPANY CULTURE & IMPACT YOUR BOTTOM LINE? 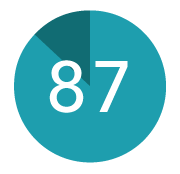 Highly engaged employees were 87% less likely to leave their companies. 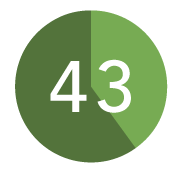 Company offices with engaged employees were up to 43% more productive. 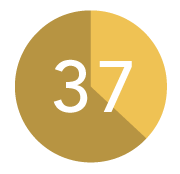 Companies with high engagement experience 37% lower absenteeism. Free Recognition & Reviews for up to 5 Employees! Create a free account now. No credit card required.